David Hockney's early lithograph, 'Fish and Chip Shop' (1954), goes on sale at Christie's in March. Fish and chip shops may not be the obvious place to find a work of art – except, perhaps, in Yorkshire. In 1954, the 17-year-old David Hockney made a lithograph of his local chippie, The Sea Catch, around the corner from his family home in Eccleshill, Bradford. It shows the proprietors Hayden and Janet Smith behind the counter and him propped up against it. He would turn up of an evening after a 12-hour stint at the Bradford School of Art, or after pushing an old pram filled with paints and equipment around the town and drawing or painting whatever scenes of everyday life caught his eye. For his first forays into printmaking he chose subjects particularly close to home: himself with a dark Stanley Spencer fringe; Woman with a Sewing Machine, for which his mother Laura served as model; and Fish and Chip Shop. He must have been looking at Vuillard and Bonnard at the time for there is a real intimiste feel to these images, with their emphasis on cosy interiors, flattened, simplified shapes and patternmaking. Here he pays particular attention to the decorative geometries of the shop’s tiles and the swirls of Mrs Smith’s blouse. What adds to the charm is the lithograph’s artisanal quality, for in these early years he made the prints himself in very small, unnumbered editions, not all of which were signed. Only six are known of this one. What makes this particular signed and dated pull unique is that it was given to the Smiths as a token of friendship and thanks, and was hung pasted on board above the deep fryer. It is not the environment any conservator would advocate but its odd stain and wear and tear are part of its peculiar history. After their retirement the print was proudly hung in their home and now the late couple’s descendants have consigned it to auction at Christie’s. Estimated at £6,000–£8,000, it joins some 30 prints produced by the artist over three decades in the 29 March sale of Prints & Multiples. While not precisely cheap as chips, Hockney enthusiasts should be aware that when another rare pull of Fish and Chip Shop came up at the same auction house with a similar estimate, it fetched £20,000 plus premium. Estimates in this group do, however, start at £1,500. 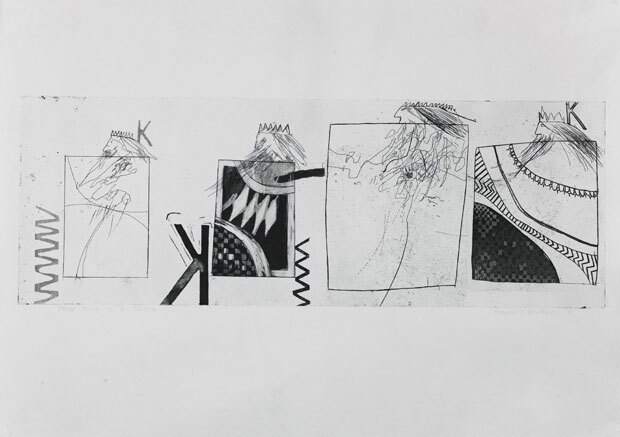 Prints are not included in Tate Britain’s current Hockney retrospective (no doubt this was considered unnecessary after Dulwich’s celebration of 60 years of Hockney’s printmaking in 2014), which is why the first show of his complete early etchings – part sale, part loan – at Hazlitt Holland-Hibbert is a must (until 10 March). The artist took up etching as a post-grad at the Royal College of Art simply because he had run out of money to buy paint and the graphic department offered materials for free (art schools please note). 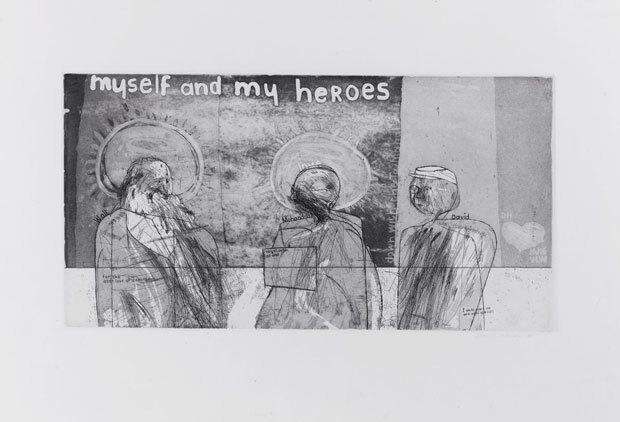 These, too, are intimate, autobiographical and whimsically self-deprecating – the hint of caricature evident in his lithographs is replaced by the expressive faux-naïf marks of Art Brut. His first attack on the etcher’s plate in 1961 is Myself and My Heroes, representing the haloed Walt Whitman and Mahatma Gandhi. Next to his own portrait, labelled David, is the scribbly etched legend ‘I am 23 years old and wear glasses’. Three Kings and a Queen (1961) won him an art prize that enabled him to make his first trip to the USA. The rest, as they say, is history. And print history. When the artist returned from New York, he paraphrased Hogarth’s A Rake’s Progress to tell his own coming-of-art narrative in a series of astonishingly spontaneous and inventive images. More Hockney prints are to be found around the corner at dealers Sims Reed. As for Fish and Chip Shop, it is not the first work of art to progress from chippie to auction block. In 2008, Bonhams offered a fish in formaldehyde that another young Yorkshire artist, Damien Hirst, had given to the owners of the Farsley Fish & Chip shop in Leeds where his brother Bradley, a friend of the son of the owners, worked. They had seen publicity for Isolated Elements Swimming in the Same Direction for the Purposes of Understanding – a shoal of fish each given their own tank – and joked that Bradley should get his brother to make something for the shop. Two weeks later, one turned up, and it was bolted to the wall next to the menu board. The following year, Hirst won the Turner Prize. The unbattered fish was offered with an estimate of £100,000–£150,000 but failed to swim away. The bad boy of Britart opens his new gallery with a show devoted to abstract painter John Hoyland. Is he trying to atone for his artistic sins?